Bohemians put last week’s loss away to Cork firmly behind them with a solid display in front of their home crowd for the first time this season. A battling performance and a stunning goal from Kurtis Byrne was enough for the three points to stay in Dublin 7. After an initial cagey opening ten minutes, Byrne collected a brilliantly weighted pass over the top of the Sligo defence with a fantastic controlled touch, allowing him enough space to strike a half-volley effort into the top corner from all of 20-25 yards. Michael Schlingermann, at full stretch, could only wave goodbye to the ball that was destined to rattle the net for a goal that could well make it into the shortlist for the March goal of the month award. Bohemians continued to play the aerial passes for Ishmail Akinade to chase, as chances came at a premium as both sets of players tried to figure each other out. The first half ended with a rare piece of Sligo pressure on the home side’s goal. Chris Lyons, the former Bohemian, twisted and turned his way into the box, but his cross was cut out just before it could reach Jaanai Gordon. 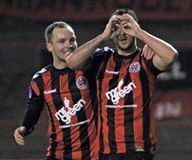 Keith Long’s marches had an excellent opportunity to double the lead barely two minutes into the second half, as a brilliant Akinade turn left the Sligo defence for dead, giving Mark Quigley the chance to shoot from a yard outside the box. Schlingermann was equal to the clever, low-hit shot that bended around the wall. The pace picked up in the second half, as Sligo looked for the leveller. Jaanai Gordon caused headaches for the Dubliners’ defence all night, and after getting the better of Lorcan Fitzgerald, he whipped in a tantalising cross that Anto Murphy eventually cleared for a corner. Keith Buckley came agonisingly close to capping off a fine performance with a stunning goal, but his 20-hard effort came back out off the post. Akinade was quick to latch onto the loose ball, but Sligo keeper Schlingermann was quick to reposition himself and snuff out the danger. Paddy Kavanagh was introduced for Mark Quigley, and didn’t take long in making a nuisance out of himself for the visiting defenders. With twenty minutes remaining his pinpoint cross found the head of Akinade, whose strong header could only reach the palms of Michael Schlingermann. The Bit o’ Red were wasteful throughout the evening, and a free kick on their left flank represented their last good chance to get something from the game. A poor delivery found no awaiting players, however, and Dean Delaney saw the ball sail out past his posts for a goal kick.